Situating privacy within the context of political philosophy, this book highlights the way in which struggles concerning the meaning of privacy have always been political. Different conceptions of privacy are here shown to involve diverse assumptions about ontology: our conceptions of self, culture, society and communication. Privacy theory’s debt to Locke, Kant or Mill, and what is at stake in their conceptual frameworks, is examined. The extent to which the term "privacy" has been used to the detriment of - and to create - weaker parties in marriage, in the workplace and now as citizens (or non-citizens) and consumers, as well as employees, is also demonstrated. 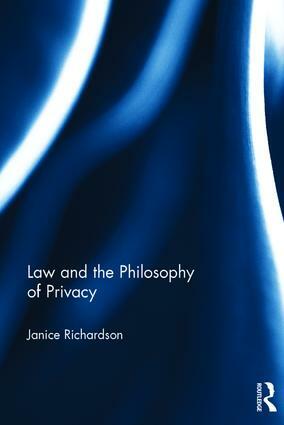 In contrast, Janice Richardson pursues the relevance of Floridi’s philosophy of information, before turning to her application of Spinoza, the philosopher of communication, in order to outline a more useful framework through which to think about privacy today. The book will be of interest to those working in political philosophy, feminist philosophy, law, the philosophy of information, sociology, media, and cultural studies. Janice Richardson is an Associate Professor in Law at Monash University. She is author of The Classic Social Contractarians (2009) and Selves, Persons, Individuals (2004); the co-editor of two books in Routledge’s ‘Feminist Perspectives’ series; and a contributor to: Angelaki, Law and Critique, Feminist Legal Studies, Minds and Machines.